Gomukh temple is situated just two kms from Mount Abu. An ancient agnikunda is present here. According to legend, Sage Vashistha performed a great fire sacrifice at this spot. The temple contains an image of Vasistha along with images of Lord Rama and Lord Krishna. Gomukh literally means cow's mouth. 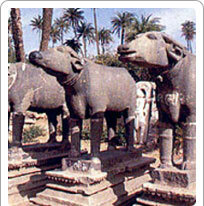 The temple has a natural spring flowing through the mouth of a marble cow, hence the temple name. The spring water is believed to have sacred and purifying properties. The temple is carved out of a rock, and lies against a picturesque back drop. It is easily accessible by car or jeep. There is descent of 750 steps that have to be covered on foot.